We include all materials to make these tiny houses as shown, but you will need to supply glues and paints. Complete instructions are always part of our kits. 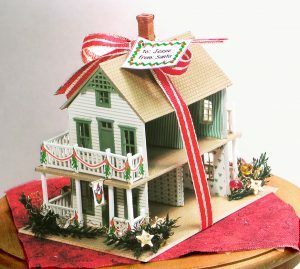 A two story, 5 room cottage dollhouse. This kit involves cutting the building components from sheet styrene, with our templates. Windows and doors are pre-formed styrene plastic. Wallpaper is included in the kit. 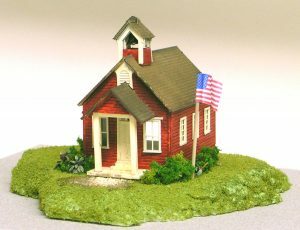 Finished house is 2-1/4″ tall. 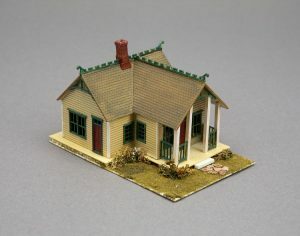 A one story cottage dollhouse. 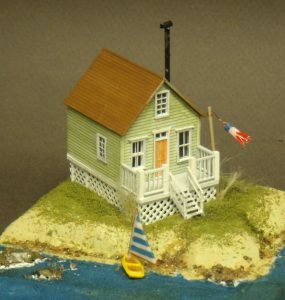 The cottage is scratchbuilt, using pre-formed wall units (adapted from one of our N-scale building kits) and several of our detailing parts. Details include the fencing, arched entry and hanging deer sign. Wallpapers are included in the kit. Finished house is 1-1.2″ tall, not including the chimney. A two story 4-room dollhouse with front porch. Again, this is kitbashed using pre-formed wall units–this time with some cutting involved. Details include porch, American flag and wallpapers. 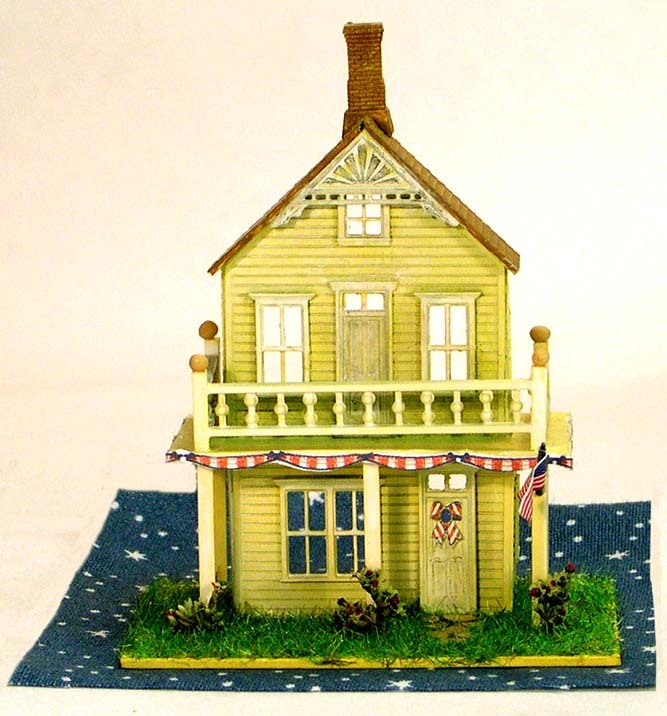 Finished house is 2-1/4″ tall, not including the chimney. 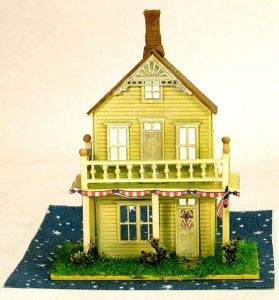 This two story house with an attic has patriotic decor: bunting, flag and a bow for the door. We have included landscaping materials, as well as wallpapers. Walls are pre-formed, but require some cutting. Finished house is 2-1/4″ tall, not including the chimney). This two story 4-room dollhouse with front porch is all decorated for Halloween! Again, this is kitbashed using pre-formed wall units–this time with some minor cutting involved. 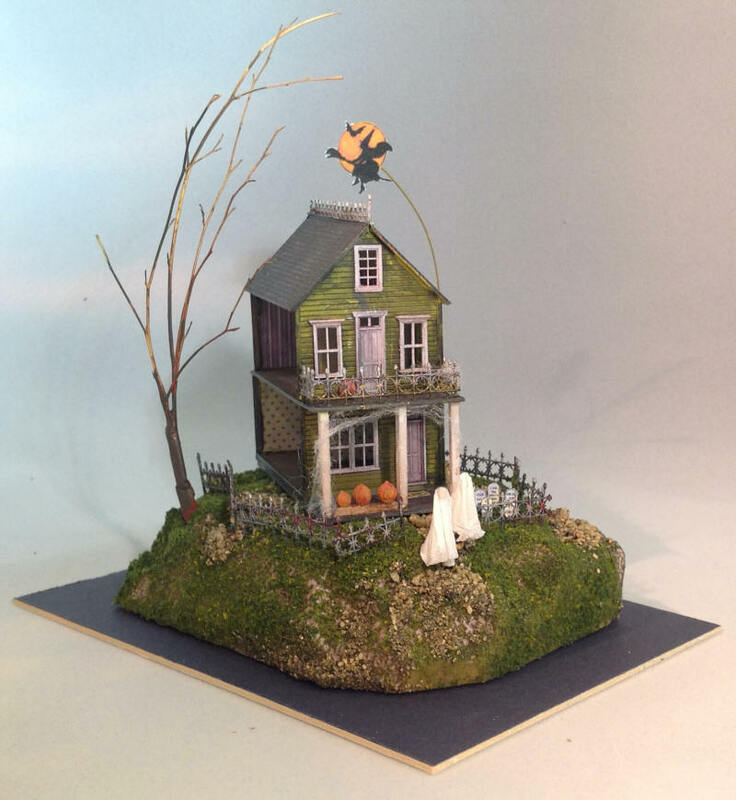 Details include porch, pumpkins, flying witch, tombstones for the yard, two little ghosties, cobwebs, a rickety fence. and wallpapers. 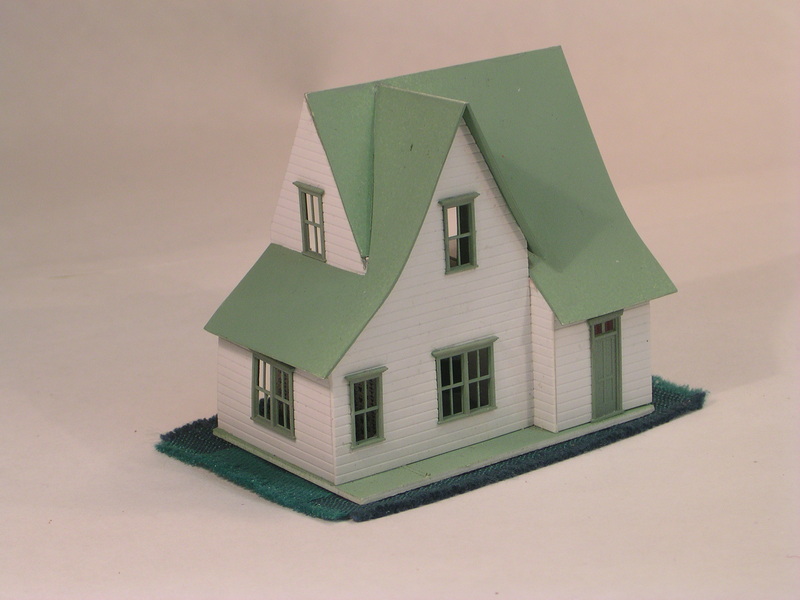 Finished house is 2-1/4″ tall, and the little project sits on a 3-1/2 x 5″ base. This two story house with four rooms and a veranda is all decked out in Holiday decor, ready to place under the tree in your dollhouse living room. You may even want to use it as an ornament on your own tree! Everything is included to make the dollhouse as shown. 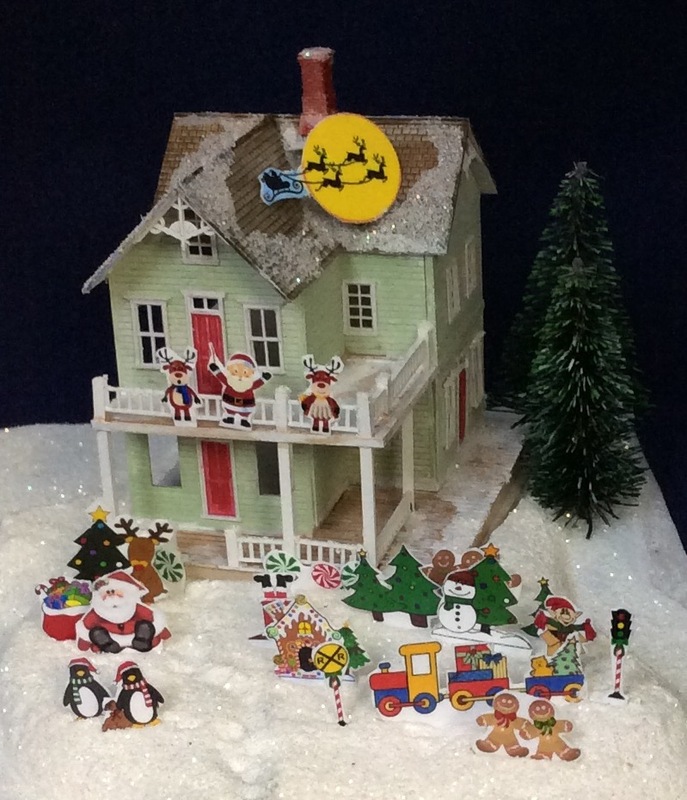 Finished house is 2-1/4″ tall (not including the chimney). 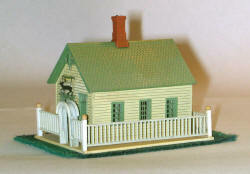 Create this cute dollhouse for your dollhouse using Grandt Line plastics. Everything is included to make the scene as shown—including wallpaper for the interior. The rear wall can be left open or closed—you choose. This house may be tiny, but has great detailing. It is the latest kit in the Grandt Line “Crossing Series” of workshop projects. Finished house is 1-1.2″ tall, not including the chimney. 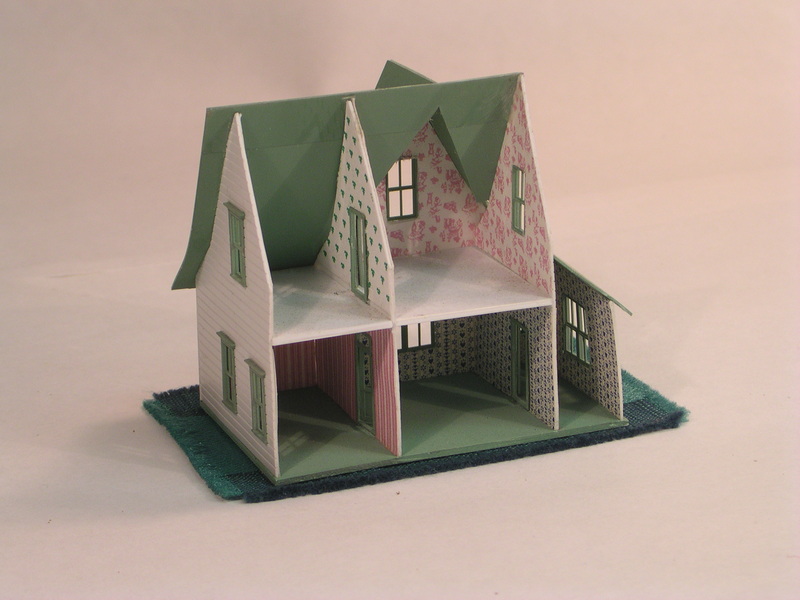 This is the 8th in our series of dollhouses for your dollhouse. It is a one-story cottage made from pre-formed styrene plastic walls. We add the front porch, lattice and some stairs to give access to the cliff-side base on which it stands. For a little extra zip, we’ve even added lighthouse wallpaper, a tiny boat (we choose either a canoe, sailboat, motor boat or row boat) and a windsock to blow in the breeze. This is the 9th in our series of dollhouses for your dollhouse. It is a sweet little one-room building made from pre-formed styrene plastic walls. We add the front porch and belfry. For a little extra zip, we’ve even added wallpaper, stove pipe, a flag pole and a little sign board for out front. The base and shrubs are also included. 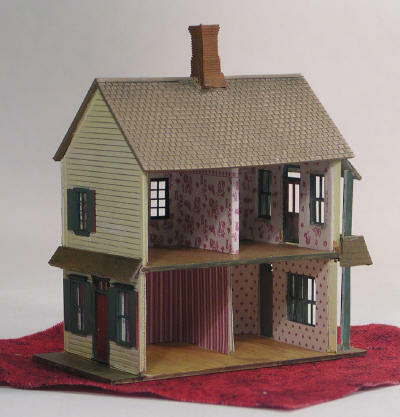 This is the 10th in our series of dollhouses for your dollhouse. 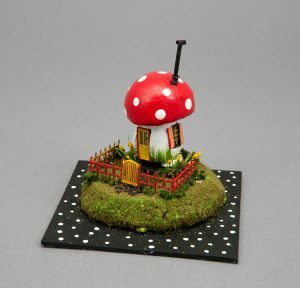 It is a fairy cottage made from a styrofoam mushroom. We add the windows, door, smokestack and fencing. The completed project sits on a ground area of 2-1/2″ square. The mushroom itself is 1-1/2″ (h) x 1-1/8″ (w) and everything is included. Our Little Apple Annie is a junior version of our ¼” scale kit and is the 11th in our series of dollhouses for your dollhouse. 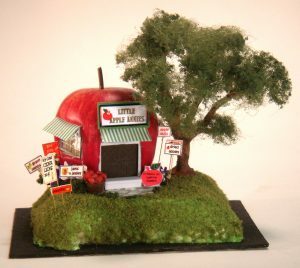 It is a one-story cottage made from a tiny styro-foam apple, so there is no need to form the structure itself. We add the door, windows and tiny awnings to give it character. We have included the materials you will need in order to construct the little fruit stand, except for paints and cement. Also included are landscaping materials signs, apples and a great little tree to give Annie’s great curb appeal. 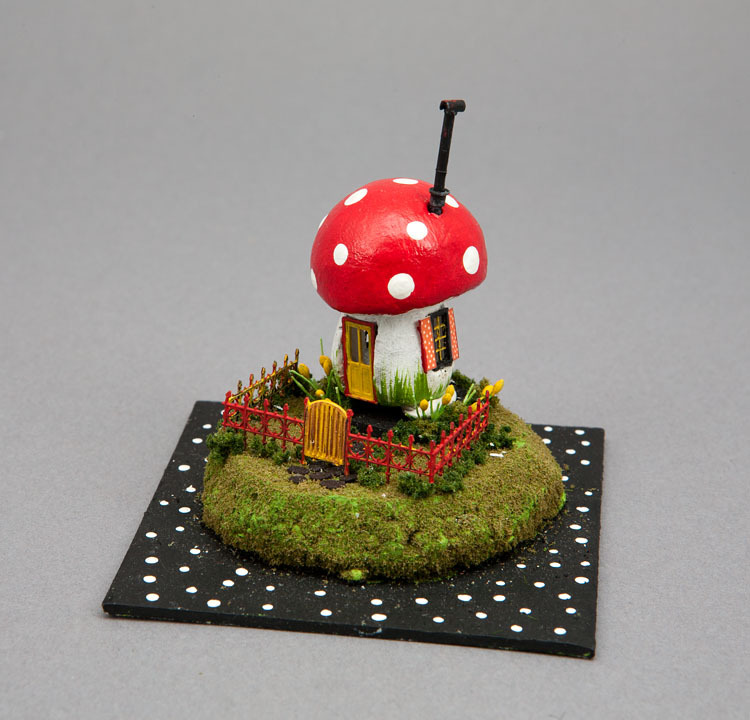 The completed project sits on a ground area of 3″ square. The apple is 1-3/4″ tall. 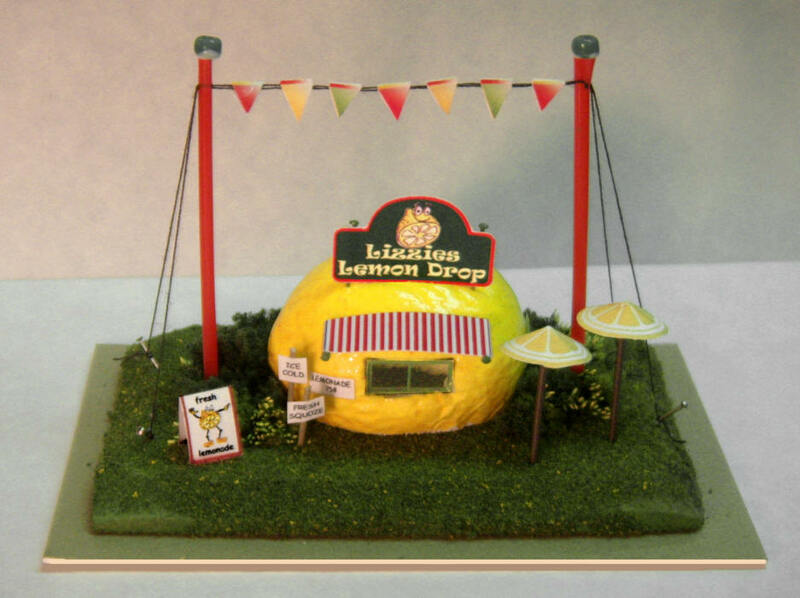 This little lemonade stand is the 12th in our series of dollhouses for your dollhouse. This one was designed based on a lemonade stand that might be seen at the county fair. It is one-story and is made from a 2-1/2″ styro-foam lemon, so there is no need to form the structure itself. You will add the door, window and awnings to give it character. We have given you the materials you need in order to transform your lemon, except for paints and glue. Included are landscaping materials, signs and other details for giving Lizzie’s that level of cuteness that miniaturists love. The completed project sits on a ground area of 3 x 4-1/2″. The lemon is 1-1/4″ tall. 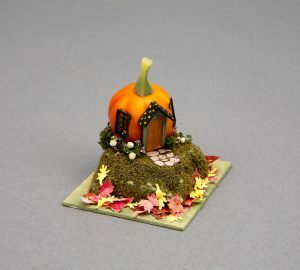 This tiny project is made from a little styro-foam pumpkin, so there is no need to form the structure itself. We add the entry way (complete with tiny moon over the door), windows and smoke jack to give it character. The completed project sits on a 2″ square base. 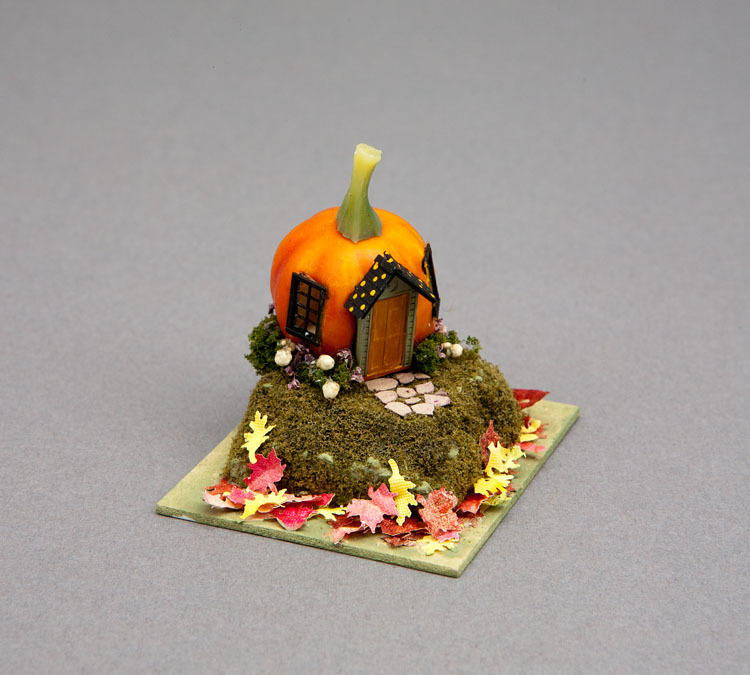 All materials (even the foliage and little leaves) are included to make this tiny house as shown.